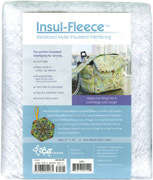 The perfect insulated interfacing for sewing lunch bags, water bottle & coffee cup sleeves, shopping bags (keeps hot things hot & cold things cold! ), oven mitts & potholders, Teapot & casserole covers, or ironing board covers. Metalized mylar is layered between polyester fleece to create a high-quality barrier that reflects heat or cold. This special combination of materials is very flexible and easy to sew through. Once you have sewn it into your project, you can machine wash and tumble dry with no bunching! Sold by the craft-pact of one sheet measuring 27"x45". (3/4 yard per pack) This is large enough for a large lunch bag or several potholders.